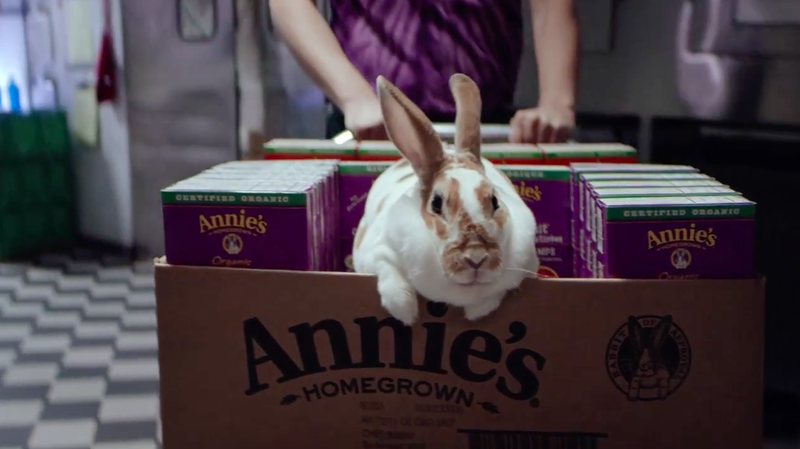 Annie's Homegrown hops online with a campaign featuring bunnies. So many bunnies. Created by the Bell Shop, in-house agency for Annie's parent General Mills, the Facebook and Instagram push consists of cottony tales anchored by 30 seconds of mind-melting adorbs. It can't be hygienic to set those cuddly critters loose all over the aisles like that, can it? And the punny tagline, "Organic for Everybunny"—suggesting the range and affordability of Annie's product line—is enough to curl your whiskers. "We built the campaign to be newsworthy, enjoyably quirky and memorable," says client marketing director Dan Stangler. "Bunnies have been at the heart of our brand identity since we were founded back in 1989. We have been sharing bunny content on our social channels for years, and it continues to be some of our most popular content." Annie's stamps a cartoon "Rabbit of Approval" named Bernie on its packaging, and some of its products are shaped like rabbits. These include the cheddar pasta in the "Chewdown" clip below, which features a bunny facing off against a cute kid (a human kid, not a young goat). "We hope consumers take away the fact that Annie's is bringing organic versions of foods their families love to more places in the store—it's not just in the Mac & Cheese and snack aisle," says Stangler. "We're now bringing the goodness of Annie's to the dairy aisle, the cereal aisle and even the frozen aisle in categories kids love, and parents loved when they were kids." Predictably, the cute cast members had a few issues taking direction. "Bunnies aren't exactly the easiest animals to work with," Stangler says. "They definitely kept us on our toes during the all-night shoot. We had to do numerous takes because, well, let's just say that bunnies were trying to 'multiply' on set. They are frisky little animals."